The best part of NFL training camp isn’t sitting out in 90-degree weather to watch your team run 7-on-7 or punt return walkthroughs. 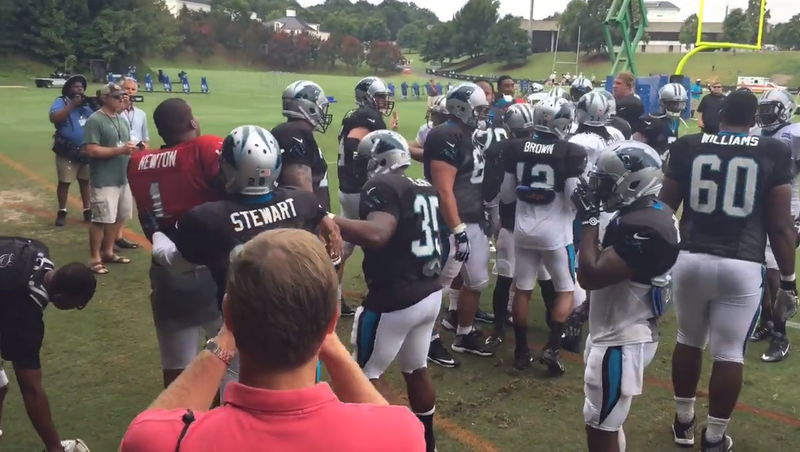 No, the best part of training camp is always the fights. And today, Carolina Panthers quarterback and demigod Cam Newton found himself demolishing a mortal cornerback. Just so we’re clear, picking a fight with a quarterback is normally a good idea! If you asked me if your team’s best corner could take Tom Brady or Matt Ryan or Geno Smith, I’d say absolutely. However, Cam Newton is not normal. He’s one of the best athletes in the league, or American sports in general, and I would advise any and all people to avoid trying to throw hands his way. In team drills, Newton looked to his right for a receiver but the offensive line didn’t hold up well under pressure. The pocket was collapsing on Newton and he fired a pass low, which Norman intercepted as he went to the ground. Norman, as all defensive backs are taught to do, got up and ran toward the end zone at the urging of his teammates and coaches. McDermott was one of the loudest voices telling Norman to score a touchdown. As Norman neared the end zone, Newton continued chase and slightly shoved the cornerback. Norman then pushed Newton slightly harder and the two went at each other. Do not fight Cam Newton. Now, off to prepare for the barrage of think-pieces concerning Cam’s maturity.